We met the day before the Fourth of July, 1997 at Whitney Portal -- our leader Rich Calliger, Mike Rinaldi, Jimothy Farhni, David Okner, Maxence Nacaury, Pat Ibbetson and myself. Unfortunately, Rich's son and wife were sick with a fever and Rich had to return home. He had already spent several exciting days climbing to the north. He left us two short sections of rope (one 7mm, the other 8mm). Unfortunately, he did not leave his cams (friends or adjustable chocks). We started our hike up the Whitney trail a few minutes before 9 a.m. After a couple of long switch backs and a stream crossing, we arrived at the second stream crossing, which is the north fork of Lone Pine Creek, about a mile from the trailhead. Just before this crossing we left the main trail and took the smaller but well-defined north fork trail. I am told that in years past much routefinding was required, but we encountered a well traveled path and progressed without difficulty. We passed through a cool forested area with several snow plants those remarkable brilliant red plant that grow on fungus, including one of the best specimens I have ever encountered. There were also many other flowers in bloom, especially red Indian Paintbrushes, here and much of the way up the canyon. Less than a mile upstream we reached a stream crossing. Here the "A Team" Mike, Jim and Dave decided to avoid any stream crossings, staying on the north side of the stream all the way to the lower Ebrersbacher Ledges. Pat, Max, Almora and I made the easy crossing and proceeded on the south side of the stream for another half mile where we crossed the stream to the north. By this time, the A Team was already high on the ledges. We followed them up the airy but easy class two ledges. From there it was a short hike up the canyon to the saddle at the end. Just beyond we rested at the junction of the trail and the wide stream exiting Lower Boy Scout Lake. We filtered water at this idyllic spot and watched a few Brook Trout-and a tiny Golden Trout. Half an hour later we crossed the stream and continued up the trail, which was still well defined and marked by carins. Shortly after this, we made our only navigational error of the trip and hiked high on the south side of the drainage, through the brushy "Clyde Meadow." We could have avoided a little bushwhacking by hiking the rock slabs next to the stream. Beyond the meadow, we proceeded on the rocky trail on the southern drainage (At this point we could have taken the northern drainage to Upper Boy Scout Lake). After another quarter mile, we reached a good camping spot less than half a mile from Iceberg Lake. We were bushed and decided to stop there, even though we had a few hours of day light and could have moved higher. The campsite was excellent. A nearby clear stream provided water. Below us was a spectacular view of the town of Lone Pine and the Owens Valley. 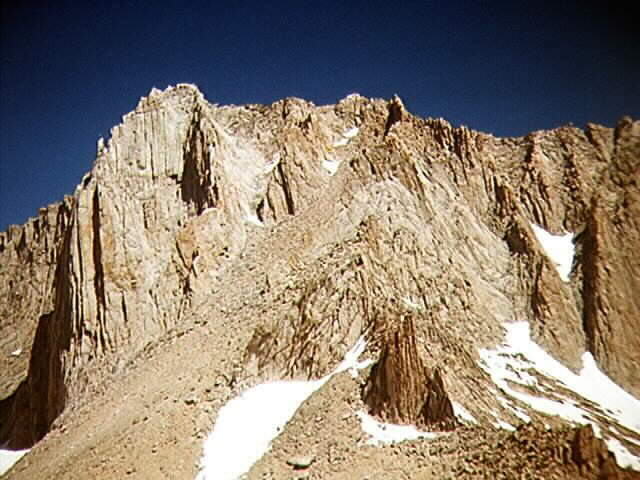 Above us was the imposing east face of Whitney and its neighboring pinnacles. On the morning of Independence Day, I woke early to another cloudless day. I had slept out in the open next to Pat's tent. It soon became clear to me that nobody wanted to get an early start, so I l let everybody snooze until about 6:30. Pat and I are still kicking ourselves for not taking photos of the alpine glow on Whitney on either of the two mornings we spent here. A few minutes before 8 a.m., we began our hike west toward the Whitney summit up the rocky trail, which soon disappeared under excellent snow. We turned northwest and hiked up a class two section. At this point, Pat put on his crampons. The rest of us just kicked steps. The snow slope flattened into a talus field and we came upon beautiful Ice Berg Lake, which was completely frozen over except for a few inches on the shoreline. Here we sat to rest, filter water and enjoy the view. 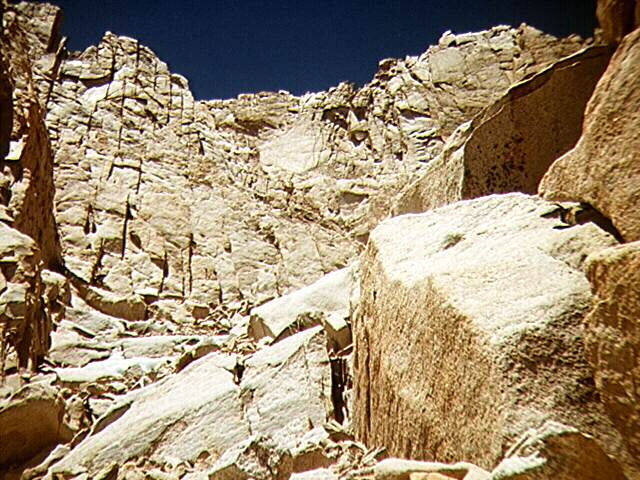 We were a few hundred yards from the snowy Mountaineers Route on Whitney which we planned to climb the next day. We proceeded on snow up the west side of Iceberg Lake, most of us without our crampons. A few hundred feet above the lake we hiked up easy talus to a notch at a saddle overlooking the Whitney-Russell Pass. Below us stretching west were three pretty lakes covered with snow and blue ice. 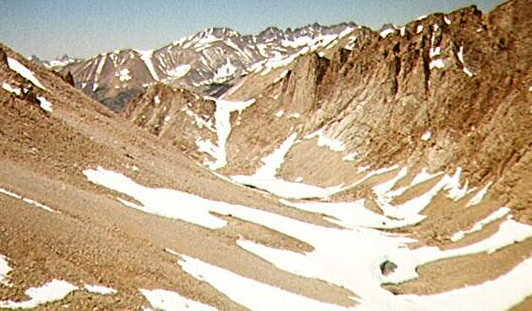 To the southwest was the northern rocky "face" of Whitney and to the north was Russell. From this point, one can take a class one cross-country route to Guitar Lake and hike up Whitney via the John Muir Trail. We left our crampons and ice axes at this spot (a big mistake for all of us except Mike and Jim) and traversed the pass to the base of a long class two couloir on Russell. After an hour long struggle we were high on the mountain and had two non-technical paths open to us. To the left was an exposed class four route leading to the summit ridge near the East (tallest) summit, no more than a hundred feet above us. To the right was a snowy class three narrow chute leading to a bump on the ridge between the two summits of Russell. From either point on the ridge, the summit was an easy scramble. Jim led the class four route and Mike followed. By then, Dave decided to retreat since he had a headache. He virtually flew down the couloir and hiked back to the notch where he ate and quickly recovered. The rest of us watched in awe as Jim and Mike expertly free climbed the solid rock and made a couple of airy class four moves. They disappeared over the ridge and made victory howls about ten minutes later. When Jim and Mike returned, Mike said that given the lack of equipment (we had ropes and some sling material but no other pro), it would not be possible to safely belay the rest of the group, which did not want to free climb the class four route. This meant that the only option was the snow chute to the ridge. Almora decided against it from the outset. Pat put on his harness but then decided not to go. I put on my harness and climbed the first half of the chute, slipping on the mushy snow. Max gave it a try but thought better of it after a few slips in the mush. After 20 feet I encountered a rocky platform in the chute and told the people to move out of the way below me because I was about to send some rock fall in their direction (which I tried to avoid but couldn't). 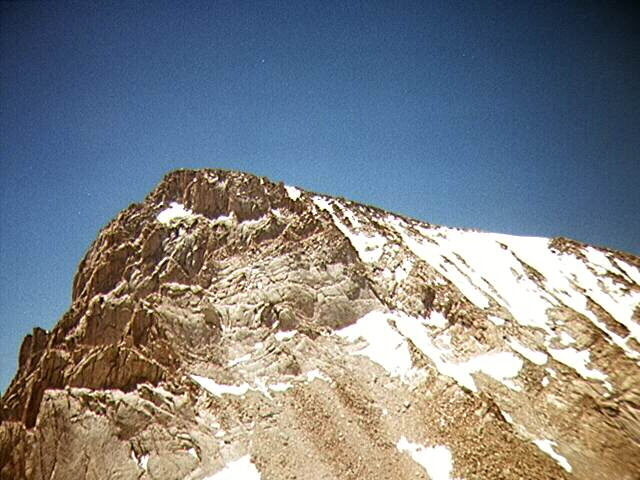 I continued without crampons and ax on the chute above the platform, where the snow got steeper and much harder. I got more nervous the higher I got and gave up before I got off the snow below the last few rocks leading to the ridge, just a few meters away. I have never been so close to a summit without making it. I am sure I would have done it, had I not left my crampons and ice ax at the saddle. We hiked down the couloir and back to camp well before sunset. On our way down the couloir we saw a couple of climbers traversing the snow on Whitney down toward the Mountaineers Route. The next morning (Saturday) we woke up after sunrise and promptly gave up on climbing the Mountaineers Route. Mike had already been out for several days and was ready to go home as was the case for Jim, I believe. Pat didn't feel like doing the Mountaineers Route and I was so bummed about not making Russell that I didn't feel like doing anything. Max wanted to do Whitney, but found no other takers for the Mountaineers Route. So we bailed. I set out first, quickly hiking down to Lower Boy Scout Lake. This time I stayed on the slabs near the stream, avoiding the bushwhacking. I met a couple of guys who were DAYHIKING! Russell. I rested below Upper Boy Scout Lake where I met Dave and the others about 20 minutes later. As Pat and I hiked down toward the ledges, I was carded by a Ranger. Fortunately, Rich had given each of us photocopies of the permits; my photocopy satisfied her. I had given the original permit Rich had given me to Almora, who planned to use it on a hike up the Whitney Trail on Sunday. The other guys passed Pat and I before we reached the ledges. Pat was apprehensive, but I was sure that we would have no problem. Unfortunately we passed one of the turns and reached a dead end on the ledges. I scrambled back until I found the correct route, after which Pat lowered our packs and followed. Soon we were off the ledges and crossed the stream. At the next crossing, Pat stopped to filter some water and I was surprised when Almora joined us. I thought she had descended ahead of us. Instead she had rested by the lake and climbed directly down the canyon, avoiding the ledges. Some bushwhacking was required, but she made good time. We crossed the stream and bade farewell to Almora at the junction with the Whitney Trail. I am sure she managed to bag Whitney on Sunday via the trail. A couple of big switchbacks later, we were back at the Portal. It was 12:30 when Pat and I made it back to my car. The others had arrived around noon. We drove up to Bishop and had a late tasty lunch at the Whiskey Creek Inn. Mike promised to lead us up Russell in October (we'll hold you to it, Mike). On the way out, Pat and I hiked up Rock Creek to Ruby Lake, scouting some of the peaks we plan to try in August (Bear Creek Spire, Abbot, Dade). We decided to drive home Saturday night and rest on Sunday in preparation for next week's trip to Colorado. Thanks to the organizer, Rich Calliger and to all the climbers for participating in this enjoyable trip. Personally, the best part of the trip was the demystifcation of Russell. I feared it like no other mountain I have ever tried, but now I know that it has just enough cracks in its defenses that one day I will succeed in standing on its summit. The south side of Mt. Russell from Whitney Russell Saddle. When we reached the headwall at the end of the chute it was worse than we could have imagined. 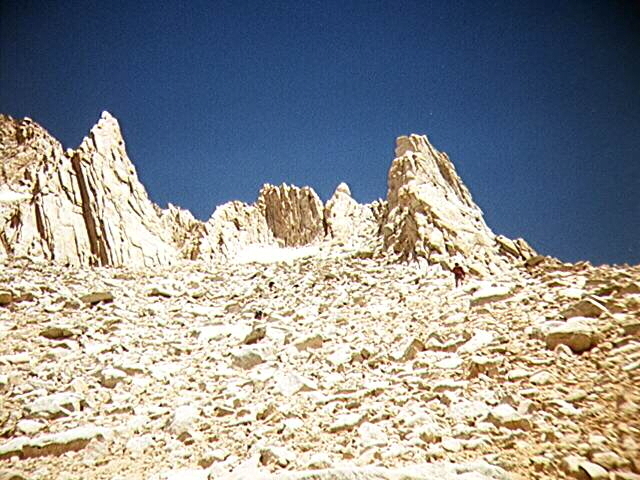 The rarely seen north face of Whitney, as viewed from Mt. Russell. 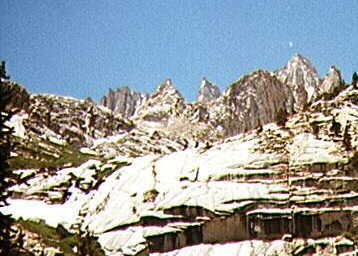 The Kaweah Massif is probably the most visible formation in the entire Sierras. Climbing the chute east of the Fishhook Arete. 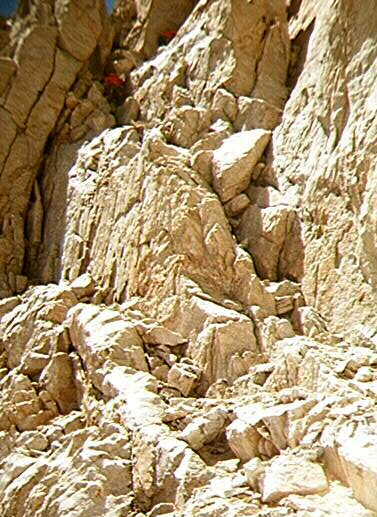 Mike and Jimothy free climbing the class 4 headwall. Whitney as seen from the North Fork.